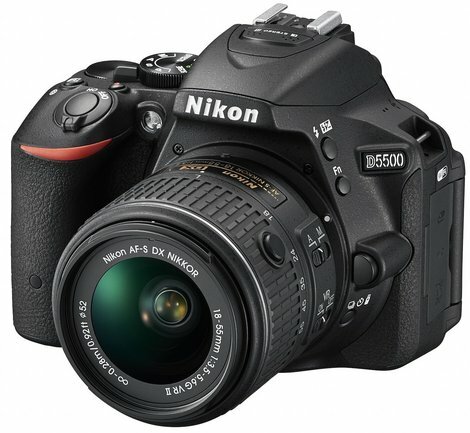 The Nikon D5500 is a fantastic mid-level dSLR, providing excellent image quality and performance. It is incredibly simple to use and sports some great features like built-in WiFi, and articulating touchscreen LCD, and more. Read more in our Full Conclusion. The D5500 is one of Nikon's newest DX-format DSLRs for 2015, and also one of their smallest. This mid-level DSLR boasts a 24.2-megapixel CMOS image sensor with no optical low-pass filter (OLPF) mated to the EXPEED 4 image processor capable of shooting in ultra low lighting conditions thanks to a native 100-25,600 ISO range. The D5500 not only wants to be a great still image camera, but also a miniature HD video recording studio. Moving images are captured at Full HD 1080p with full-time AF (Auto Focus) engaged. Changing focus (and easy access to settings and features) is a snap thanks to the 3.2-inch Vari-angle touchscreen LCD, a first for a Nikon DSLR. They also include a Mic input port, allowing you to use optional external microphones for improved audio. New for this year, Nikon has added new Effects Modes like Super Vivid, POP, and Photo Illustration to customize your images and videos. That's on top of 16 Scene Modes to ensure the camera will accurately capture the world in various shooting conditions. Picture Controls have be updated as well with a new "Flat" option and the ability to adjust the controls in 0.25-step increments as well as an expanded +/-1.5 brightness range. Lastly, this D5500 boats built-in Wi-Fi that allows you to connect the D5500 to a smartphone or tablet. From there you can either back up or share your still photos and videos, or you can even use your phone to remotely control the DSLR. Dimensions: 4.9" x 3.8" x 2.8"
See our best price box at the top right of this page to see the most current online pricing.